Fuji X-T1 with 10-24mm lens. ISO200, 1/10″ at f/8.0. 0.6 ND Grad filter. Tripod mounted. I’m going to start by apologising for showing this image. I have shown it in the past, well a similar one anyway. The reason I’m sharing it again is that I’ve been experimenting further with Alien Skin Exposure X4. I shot this image back in 2016 using a Fuji X-T1. At the time I recognised the potential of the Fuji system but couldn’t achieve a good conversion of the RAW files using Lightroom or Photoshop. I almost gave up on the Fuji entirely but decided to try the X-T2 because I liked using the camera so much. The X-T1 went back as a trade in and I stuck with the X-T2 which is now my main camera. Although I deleted most of the images shot with the X-T1, I did keep a few of the RAW files. I thought that I would keep these to test RAW converters in the future. That’s why I’m sharing this image now as I processed it using Exposure X4 and I’ve very happy with the results. When I processed this originally using Lightroom, the trees had a terrible wiggly pattern and it lost the fine details. Using Exposure X4 the image is full of detail and very sharp. It’s also made a great job of recovering the shadows in the image. I think when I have some time I’m going to do a review of a few popular RAW converters processing Fuji RAW files. I think it will make for an interesting experiment. If you haven’t seen my latest video showing my recommended Exposure workflow, you can watch it on Youtube. Exposure from Alien Skin is one of my long-time favourite processing tools and yesterday they launched Exposure X4. I’ve already got my upgrade and I can see a few enhancements and new tools. You can find out more about the enhancements on the Alien Skin website where you will also find a free trial version to download. Despite the new tools and features, I’m not really blown away by any of them and I didn’t know if they justified the price of the upgrade. The Smart Collections is a nice addition and I can see Exposure is becoming more of a Lightroom replacement, but it’s not exciting me. Then I found the exception which is hard to quantify; Alien Skin has just described it as RAW processing enhancements. Having processed the shot you see above with the software I thought that’s not bad. The RAW file came from a Nikon D800, so I thought I would try some RAW files from the Fuji. And that’s when I the results stopped me dead. The RAW conversions are incredibly clean. There isn’t a wiggly worm pattern anywhere to be seen and the detail is incredible. Even RAW files shot with the 18-135 lens look amazingly sharp and detailed. Fuji X-T2 with 18-135 lens at 135mm. ISO400, 1/45″ at f/11.0. Capture sharpening only applied as part of processing in Alien Skin Exposure X4. If you’re a Fuji RAW file shooter, do look at the trial version of Exposure. I would be interested to know if others also like the results. To celebrate Exposure X4’s launch I decided to answer the question I’m often asked about Exposure “what’s a good workflow”. The video will demonstrate this using Exposure X4 and goes live around 15:30 UK time. Here’s the link to my YouTube Channel if you haven’t already subscribed. Blea Tarn, The Lake District, Cumbria. Fuji X-T2, 16-55 lens, ISO200, f/11.0, i/105″. Kase 2 stop ND grad (hard). Before I went to Italy for a couple of weeks, I started experimenting with Luminar 2018 from Skylum. Now I’m back I have been looking at the software more and I’m even more impressed with the results I’m getting. Looking back to the earlier versions of Luminar this wasn’t the case, but they have improved the software significantly. I now see myself working more with Luminar, On1 and Alien Skin in the future (as well as some Topaz tools). This is especially true now the future of Nik is uncertain once more, with DxO Labs in financial difficulties. Anyway, I wanted to return to some images from the end of last year to see how they could be improved with Luminar. The one at the top of this post is an example of one that I initially passed over. After a little work in Luminar it seems to have an appeal and has retained a natural look. I just love learning and working with new software. Porth Kidney Sands, Cornwall. Olympus EM5 and 12-40mm lens. ISO200, 1/640″ at f/7.1. Processing in Exposure X2 with the Velvia 100 film simulation. I have finally taken the plunge and upgraded my copy of Exposure from Alien Skin. This is a great all-purpose piece of editing software which I tend to use as a plug in to Photoshop. What I really like are the film simulations. I already owned Exposure and was resisting the temptation to upgrade. What really changed my mind was a 40% discount and the other Alien Skin tools thrown in. These were Blow up for enlargement and Snap Art for painting special effects. I’m not really one for painting effects but since upgrading my iPad I have started to draw more. I’m finding packages like this provide a nice yet creative break from work. I’m now under more pressure to find time to experiment with the new version of Exposure and learn how to best use the new Layers feature. If you live in the UK and enjoy Landscape Photography you will have noticed that the light is growing more harsh and the time of day for shooting great Landscapes is becoming more restricted. At this time of year you often find yourself need to be shooting landscapes at either end of the day or in bad weather. If you are out in the middle of the day in bright sunny weather, you can find it very difficult to shooting anything. This is when I like to turn my attention to Infrared photography as these are the ideal conditions. If you shoot infrared with a digital camera you really need strong sunlight to get the best infrared effects. Whilst you can shoot in any weather conditions, if the light isn’t strong you will find that many of your images have a soft appearance, lacking sharp detail and look a little grainy. Compare this to scenes where the light is strong and you can achieve some amazing results. This was the case yesterday when I went for a walk around the Chatsworth Estate. I found myself snapping away at all sorts of scenes that were literally transformed by the infrared capture. 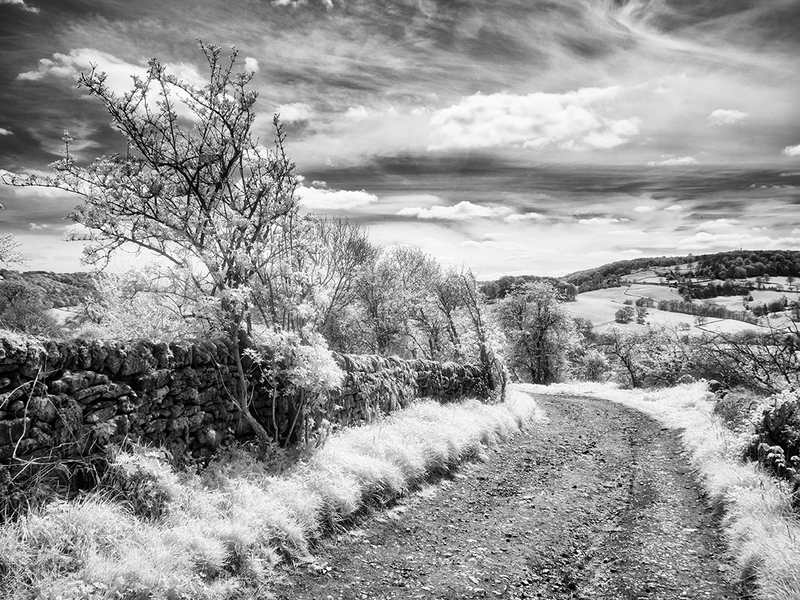 Whilst I do love Infrared photography, I miss the halation effect that could be seen in films such as Kodak HIE. If you want to create the glowing white effect and shoot digitally, you will need to simulate it in some way as I have done in the image above. In this case I used Alien Skin Exposure 7 which has a good halation simulation. I then selectively introduced it into my image using a mask in Photoshop. This was to restrict the effect to the foliage as I didn’t like how it affected the sky. I hope you like the finished image. It really didn’t look like much with a conventional camera but was transformed by infrared.